Indie Beer Week is a collaborative event jointly promoted by brewers across the island of Ireland. Despite the name it's a 5 day long celebration of the craft of local breweries. The breweries involved organise an event in their community, mostly in their brewery, local pubs or off licences as a way to highlight your local beers. We've also got the support of lots of off-licences, pubs and restaurants who'll be promoting their local beers during Indie Beer Week. As well as the schedule of events going on locally we'll be trying to make as much noise as we can on a national level and get everybody talking about local Irish Beer! Indie Beer Week is brought to you by the Independent Craft Brewers of Ireland. The ICBI is a trade organisation for independent microbreweries across Ireland. 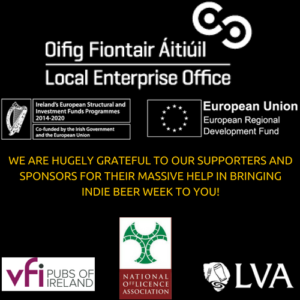 Participants in Indie Beer Week don't have to be members of the ICBI - but they do have to be independently owned Irish breweries and meet the criteria for a microbrewery which is laid out by the government and Revenue.